On November 20, 2012, the Federal Bureau of Investigation (FBI) in Newark asked for information from the public for a series of four bank robberies that occurred starting in August 2012. During all of the robberies, the man approached the teller, gave them a note demanding money, and walked away with an undisclosed amount of cash. During two of the robberies, he wore a baseball cap containing the letter “R.” The FBI believes the letter stands for Rutgers. On August 9, 2012, the man entered the TD Bank on 74 Route 571 in East Windsor, New Jersey around 7:12 p.m. He was wearing a short-sleeved shirt, dark pants, large sunglasses, and a baseball cap. On August 23, 2012, the man entered the TD Bank on 1010 Raritan Road in Clark, New Jersey at about 7:50 p.m. He was wearing a dark baseball cap, a short-sleeved polo shirt, and dark pants. 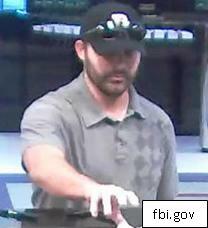 On September 8, 2012, the man entered the TD Bank on 3024 Route 516 in Old Bridge, New Jersey at approximately 2:50 p.m. He was wearing a baseball cap, a blue polo shirt, gray pants, and sunglasses. The last robbery occurred on November 16, 2012 at the TD Bank on 70 Middlesex Avenue in Metuchen, New Jersey around 7:15 p.m. He was wearing a black jacket, gray shirt, blue jeans, white sneakers, large sunglasses, and a baseball cap. The man is described as white and about 5’8” tall and 170 pounds. He had a beard and mustache during all of the robberies. If you have any information about the bank robberies, you need to contact the FBI at 973-792-3000. Do not attempt to apprehend the suspect on your own. You can also contact 911 if you suspect you’ve spotted the bank robber.